They say that dogs are man’s best friend, and they’re right. Dogs are excellent companions that make life sweeter with every cuddle. We at Wildewood Apartments accept many different kinds of dogs into our community, so feel free to bring your special friend. We do not, however, accept Akitas, Doberman Pinchers, Huskies, Malamutes, Great Danes, Mastiffs, Rottweilers, Shepherds, St. Bernards, and Bull Mixes. The only “bull” allowed is the English Bulldog. So, as long as your dog isn’t on the restricted breed list, you’re going to need to dog proof your apartment. Dogs just love to leave fur all over the furniture, the floor, and your clothes. This is especially true during spring because many breeds are shedding their winter coats. So, what can you do to protect your furniture? Placing a cute, wool blanket around the cushions of your couch is a very easy way to minimize the amount of dog hair in your life. When family and friends come to visit, you can simply remove the blanket and presto! If your dog leaves white fur everywhere, then try to get yourself some white furniture. 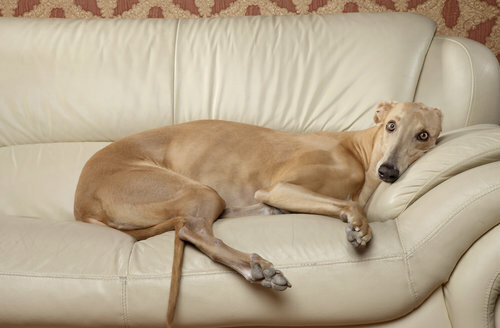 Color coordinating your dog with your furniture will make all the excess hair seem less of an eye sore. Couple this practice with regular brushing and the pet hair will seem like much less of an issue. Some dogs love to chew. Some dogs love to chew things up particularly if they are left alone for several hours a day. So, make sure that any cables, wires, headphones, and other electronics are out of the dog’s reach before you leave your house. If shoes are your dog’s snack of choice then you might want to invest in a shoe rack that hangs in your closet. If you can put your dog in a crate while you’re away, then you can always try that. Some dogs, however, do not tolerate crates in any capacity because of negative associations. Some dogs also will not tolerate being left in a room with a closed door. In those cases, just make sure that there isn’t anything on the floor for the dog to ruin. Try giving your pup a Kong filled with delicious goodies to keep them busy when you head off for work. There are a ton of great Kong recipes available online. So, look some up and leave your dog something to do so they won’t find something to do. Play best y8 games at the website. Y8 games online play this games, relax, have fun. Remember to keep the community clean! Always remove any waste produced by your dog while you’re on your walk. This entry was posted on Friday, March 27th, 2015	at 9:06 pm	. Both comments and pings are currently closed.